RIVERSIDE — The Mark Takano for Congress campaign announced Oct. 29 that President Barack Obama is endorsing him in the race for the newly redrawn 41st Congressional District. This endorsement comes on the heels of an endorsement by former President Bill Clinton last week. 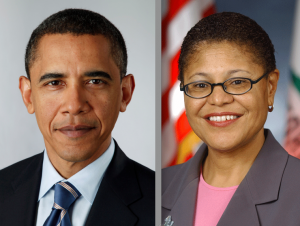 Rep. Karen Bass, who represents the 33rd Congressional District (which includes Culver City) and previously served as speaker of the California State Assembly, said in a statement on Oct. 31, “With your vote, Mark will join me in Washington and fight for those in Riverside County and the Inland Empire. “This is an historic election because we have the opportunity and responsibility to re-elect President Obama and launch a successful second term that will allow the president to complete the work he’s started – to focus on jobs, economic growth and protecting social programs including Medicare, Social Security, and services for veterans and students. “President Obama cannot be successful if we don’t do our part to bring leaders like Mark Takano to the U.S. Congress that will work with the president. We need 25 seats to win back the Congress, but that can’t happen unless you vote for Mark. “While Mark’s Republican opponent has played nice, he will be forced to join his conservative colleagues in setting an agenda that will oppose the president at all cost. This will not be good for you nor will it be good for America. “From the time when I was in the State Assembly and held town hall meetings on the state of blacks in the Inland Empire, I’ve been proud to work with leaders like Assemblymember Amina Carter (D-Rialto) and Mark Takano to ensure our government responds to the needs of those in Riverside and beyond. Takano, a member of the Riverside Community College District Board of Trustees, is running in a district that includes Riverside, Jurupa Valley, Moreno Valley and Perris. His Republican opponent is Riverside County Supervisor John Tavaglione.